A stunning little spot on the edge of the firth of the Forth offering lovely local cuisine alongside local and craft beers. Great views! 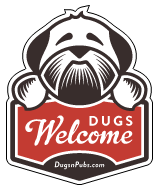 Family & dog friendly pub in Newhaven with views of the Firth of Forth to Fife. You will find wooden panels, model ships and historic photographs (as well as a warm welcome). Belhaven pub therefore serve cold Belhaven best! Large selection of Malt whiskies & wines. Food examples: Battered Haddock & Chips, Belhaven Steak Pie. Outdoor seating area at front (picnic benches). Bright, spacious cafe, directly accessible from the cycle path with ample outdoor seating. Serving brunch, lunch, speciality tea & coffee and home baking. Dogs allowed inside with Dog bowls provided. Open every day 9-5. (Closed Xmas Eve, Xmas Day, Boxing Day). No alcohol allowed on the upstairs terrace. There are a total of 5 dog friendly listings in the Newhaven category. Please log in, or sign up as a member to view all listings.